10 Types of Children Who Need to Undergo Play Therapy (What Does It Do?) - Children really like to play. 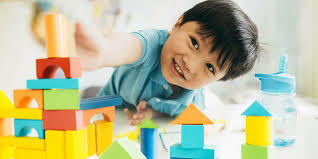 In addition to satisfying curiosity, children can also learn various things through games. In addition, playing also offers a variety of other benefits for child development. That's why playing can also be used as care for children with special needs. This method is known as play therapy ( play therapy ). However, what children are advised to take this therapy? Children with special needs generally have difficulty doing activities that other children can easily do. However, this condition does not become a barrier for children to be able to act and interact with their peers. As the name suggests, therapy is carried out with a variety of children's games, ranging from playing dolls, arranging blocks, drawing, coloring, playing musical instruments, and other games. Children whose parents divorce and live separately. Children who are disabled due to burns, survivors of accidents, and/or have birth defects, such as deafness, blindness, or mute. Children who experience trauma due to accidents, domestic violence, victims of natural disasters, or victims of sexual violence. Experiencing sadness or tendency to depression after the person he loves has left behind. Children who have phobias and withdraw from the outside world. Children who tend to be aggressive, unruly, and have difficulty controlling emotions.